BBMP’s recent entry into Facebook may have impressed a few, what with the Bengaluru Traffic Police holding fort well on the social media. But not Justice Santosh Hegde. "BBMP is a den of corruption", he says, in the direct and unhesitating way he is known to speak. Justice Santosh Hegde, a man who needs no introduction to Bangaloreans, recently endorsed Citizen Matters‘ ‘Living in Bengaluru’ book at an event in Whitefield. Subramaniam Vincent, Editor, talked with him over a number of recent political and graft-related developments in the city, as they drove to the venue. This interview happened in mid-September when the Coalgate scam was dominating headlines around the country. Will he endorse candidates in the assembly elections next year? What does he say about the battle between top cop R P Sharma and the state government over prosecuting engineers in BBMP? About the government wanting to push out ADGP of Police R P Sharma from Bengaluru Metropolitan Task Force: Why do you think this time there hasn’t been the kind of public outcry that was there earlier when you offered to quit as Lokayukta? That is because the biggest scam in the media, is ‘Coalgate.’ People are concentrating on reading this issue rather than taking up the issue of Mr Sharma’s transfer from the Task Force. Otherwise this is an issue of concern, because today as everybody knows, BBMP is a den of corruption. Practically every decision they take is motivated by corruption. I think Mr. Sharma identified these things and when he suspended the engineers and wanted to chargesheet them, there was a threat. There was a huge backlash, almost a 1000 engineers gathered to protest.. This is what happens when corruption gets accumulated and some bull in a china shop goes in and starts digging. And what were the people doing? People should have supported Mr Sharma and the Task Force in this. I think they(people) did not rise up to the occasion. There is some rumour that the Urban development Ministry is preparing an ordinance of the kind which will allow the state government revoke BMTF’s powers. Technically, BMTF is defined as a Police Station, and they have the ability to chargesheet officials. Vidhan Soudha is interested in taking that power away. If this happens, is there a recourse for the public to take? Legally speaking, I don’t think the public can file for a petition and demand that power should be retained with BMTF because the power of making a law or repealing a law lies entirely with the legislature. Government being a legislative power, you cannot question it that easily, unless that power is exercised by an authority that has no right to exercise that power. Now Article 215, gives the legislative, power that is there in Parliament to bring out ordinances because of the urgency of the matter. But if it is exercised malafide or by an authority that has no right to exercise that power then the court will interfere. Otherwise it will be extremely difficult for the courts to interfere. So there cannot be a challenge on some constitutional clause that the removal of this BMTF power, is infringing on some other rights? Democratically, the public can agitate and make the government understand that they cannot take away this power and it is in public interest and in the interest of the BBMP itself. Let me tell you, the moment they (state government) found that Lokayukta was more proactive than before, they started not yielding to the requests. Lokayukta would ask for certain extra powers because as, as time goes (25 years since the inception of Lokayukta), and, you find out the deficiencies (in the working of the Lokayukta system) and you want to rectify it. And when I came in the beginning, government was very co-operative and when they found that my working was also proactive, they said no. If given a chance they would have closed the Lokayukta! So let’s say the government passes the ordinance. Can people can take the cases that BMTF will not be able to prosecute to the Lokayukta? Certainly. They can do it if it is an act which amounts to criminal misconduct. They can invoke the jurisdiction of Lokayukta or if the Lokayukta is non-functional, then they can file a complaint before the Lokayukta Court. There are cases where BBMP engineers are chargesheeted. Can people can take those details and go independently to the Lokayukta court? If they are already chargesheeted, parallel proceedings are not allowed. Can you comment on the government not appointing a Lokayukta yet? Government speaks about Lokayukta appointment only when the High Court expresses its view in this matter. It wants to keep the High Court at bay, so it gives all sorts of excuses like "we’ll do it in 15 days, there is this consultation process going on and let the Supreme Court decide on that." Such excuses are being given but in reality I feel they don’t want a Lokayuka until the 2013 elections. Just before the elections they will certainly appoint a Lokayukta. Similarly the Parliament will enact a Lokpal bill and they will appoint a Lokpal just before the election 2014 elections. That is what they will be canvassing around in the elections. None of them want to go the elections saying they don’t want a Lokayukta because it will have adverse effect on their electoral politics. Why are they not doing it today? Because between today and the elections, that person who is occupying the office may bring out more scams. You seem to be saying that appointing Lokayuktas, creating a Lokpal and the like does indeed buy some goodwill to the governments, but by doing it just before elections, they think the public can be fooled. Exactly. Public have a very short memory. But if they don’t make the appointments, it will have an adverse effect. On the process of nomination to the Lokayukta, if you were to name people from the judges fraternity that you know, would you pick anybody? It is illegal under the Karnataka Lokayukta Act (for me to suggest names) The Act prescribes a collegium of Chief Minister, Leader of the Opposition, Chairman of the Legislative Council and Speaker of the Assembly and the Chief Justice and 3 judges of the High Court. Does the appointment from the collegium have to be a consensus candidate? Not necessarily, it could be a majority also. Let’s move over to the Hazare movement, which has now reached a critical point. Where do you come in on the future of ‘India Against Corruption’ group? I joined India Against Corruption only for the objective they had then – fight against corruption and fight for a strong Lokpal institution. If that continues, well I am there. If somebody else starts a similar movement against corruption, I will be with them, unless they don’t want me to. I am not for politics. I don’t oppose anybody from the India Against Corruption forming a political party because I believe that there is a need of change in political blood in this country and people with a commitment for democracy and the betterment of the country must enter politics because today the people who are managing politics are all there to make it into a profession or earnings or ‘killings’, let me say. Earlier I have seen , 60 years ago, I can distinctly remember people who fought for the freedom of this country and who really wanted to serve, joined politics. They never had salaries. They only had travelling allowance and their actual food cost. But they went there to serve their people. But things have changed very much, therefore the need to ‘change the change’. I think there is a need for fresh blood to be infused but I would rather, be a watchdog against those people as there is no guarantee that when they enter politics things will be better. On that note, in the case of Ashwin Mahesh, you took the step to endorse his candidature in the MLC elections in Karnataka few months ago. Yes, depending upon the candidate and my availability. Yes, if there are good candidates, I will certainly canvass. So lets take the MLA elections coming up, what will be your criteria to assess, how do you take the call? Anybody trying to influence me will not work. Let me tell you, the moment the Anna Team came out in the open and said they want to form a political party, I got atleast about 7-8 calls saying "I want to contest" and I don’t even know who they are. They wanted me to endorse them for the 2013 elections and many of them are highly educated people. How would you assess an individual? Do they have to come and meet you? Thats why I said, I will not go to all constitutencies. I will not go and canvass for a political party. Take, Meenakshi Bharath and Ashwin Mahesh. With them I had interacted in a field when we were working together and I find, they are the persons to be in the legislature. If somebody else comes and says I know this person or is my brother-in-law or a person recommending him, maybe well known to me; but no, I will not (endorse). This must be crossing the minds of the people now because there are people thinking of trying to get better candidates to run for the MLA elections and R K Misra has floated a platform to create a base for good people to run and support them and so on. I am sure some of them would like to get your endorsement. Sanjuktha Mukund sent in this prize winning entry for Citizen Matters’ Independence Day citizen journalism contest. Water is a contentious issue in the city today. And this man helps people make effective use of rainwater and recharge borewells. 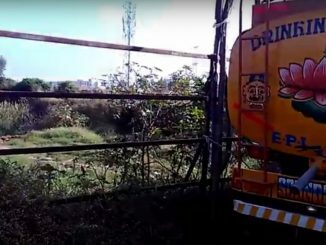 Water tanker collects water stored in an abandoned land. Where will this water be supplied? Is it safe to drink such water, or to rely on water tankers for safe drinking water? Please,we cannot turn mr.Hegde into a credit rating agency for candidates. However,there is need to have a committee of distinguished panelists unconnected from political parties to endorse certain contesting candidates who have been known to be honest and committed to social work.Women too need to be encouraged who can work independently.